It's the end of another long campaign season. Hopefully the attention of our politicians -- both new and returning -- will shift quickly to the critical work of governance by reaching across the aisle, using creativity and innovation, and bringing diverse constituencies together to craft effective, pragmatic solutions. As a fishing guide who makes my living on the lower Columbia River, I urge our political leaders to begin work now to tackle one of our region's most vexing problems: Columbia Basin salmon recovery. It's time to start a dialogue among Northwest people about how to restore salmon, boost clean energy, improve inland transportation, and create good jobs in all these sectors. Only a dialogue that directly engages people and communities can lead to actions that jointly pursue these goals rather than pit them against each other. Across two decades and three administrations, federal agencies have led somewhat half-hearted efforts to protect endangered Columbia and Snake River salmon and steelhead populations from extinction -- and protect the many jobs and businesses those efforts support. Despite big spending, these programs haven't worked. Four of five plans have been rejected by the courts. Costing more than $12 billion so far, it's our nation's most expensive endangered species program. Thousands of commercial, recreational and tribal fishing jobs in the region have been lost as wild salmon populations -- and fishing opportunity -- have declined. Perhaps the most telling evidence are the salmon themselves. Nearly all our imperiled salmon populations in the Columbia and Snake rivers remain at levels far below those needed for recovery. For our Northwest fishing sector and other important regional industries, uncertainty has been another byproduct of this repeated failure to protect and restore salmon. As a small-business owner, I can tell you that this uncertainty has been bad for business. We all know more must be done in the Columbia Basin to rebuild healthy populations, but we have yet to achieve an effective, science-based plan that meets the demands of the law. The bottom line is, we've spent too much money and time for too little progress. However, the public and a growing number of Northwest political leaders now support a new approach. More and more, people recognize that asking the agencies to go through the same old motions to produce another illegal plan will neither restore salmon nor serve our regional interests. In late September, Oregon Gov. John Kitzhaber and Sen. Ron Wyden stepped forward in support of a new approach: convening regional stakeholder discussions in order to craft a new plan that restores wild Columbia Basin salmon while also protecting our clean and affordable energy supply. These two leaders are not alone. Others include Oregon's other senator, Jeff Merkley, and Idaho Sens. Mike Crapo and Jim Risch. House members Earl Blumenauer, D-Ore., and Jim McDermott, D-Wash., are also strong proponents of setting up a stakeholder process that considers all credible options and crafts a plan that restores salmon, creates jobs, and meets the needs of our communities and economy. Other important Northwest leaders are rethinking their approach to this issue as well. Despite a winning record in the courtroom, our coalition of salmon and fishing advocates, along with the state of Oregon and Nez Perce Tribe, also support this new approach. By bringing together affected interests -- fishermen, farmers, utilities, energy consumers, shippers, and others -- to work together to craft a lawful, science-based plan, we have the greatest chance of producing a blueprint for recovery that also has the support of the region. Now it's up to the Obama administration. Though it embraced a failed salmon plan in 2009, which has since been ruled illegal, the administration now has an opportunity to work with leaders on both sides of the aisle and initiate a process that brings together both the sovereigns -- Northwest states, federal agencies, and Columbia River Treaty Tribes -- and the stakeholders, to work in common cause toward shared solutions. There's still time to get this right. We should get started today. Bluefish.org offers $1000 Reward to anyone who can reveal how the federal plan will recover Idaho's Sockeye Salmon. Count the Fish Returning Adult Sockeye counts from Lower Granite Dam and in the Stanley Basin. 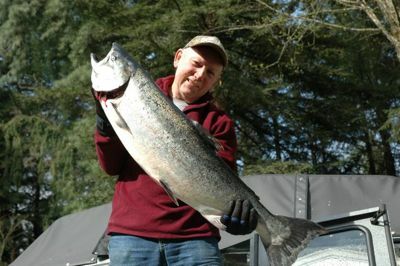 Bob Rees of Tillamook, Ore., is the owner of a fishing guide service and president of The Northwest Guides and Anglers Association.